Example of a graphic to educate the public on common terms used to communicate storm surge information. Click on the image for a larger view. In 2013, the Center for Operational Oceanographic Products and Services (CO-OPS) made several enhancements to its existing products to be consistent with messages from the National Hurricane Center (NHC) on storm surge risks and impacts. The result is more consistent and effective communication regarding storm surge and inundation. While maintaining flexibility for users with specific needs to access alternate tidal and vertical datums, all storm tide related products will now feature Mean Higher High Water options and language consistent with NHC forecasts regarding inundation at the coast. NOAA’s Storm QuickLook product, which highlights real-time storm tide information at locations where a tropical cyclone is impacting the U.S. coast, has been upgraded to provide more datum options within the product, allowing users to further customize their storm tide and tidal predictions. To educate the public on common terms used to communicate storm surge information, CO-OPS and NHC collaborated with The Weather Channel, CNN, and other media to inform these partners of the agreed upon terms and the enhanced storm tide products. NOAA provided links to real-time water level information and storm surge graphics to the media outlets to use with their audiences. To support the education effort, The Weather Channel filmed a video at the Bay Waveland Sentinel tide station in Waveland, Miss., to inform viewers on the importance of preparing for extreme weather events and taking action when evacuation orders are issued. NOS forecasts for HAB respiratory impacts are now more widely disseminated as part of the NWS Beach Hazards Statements for the Tampa Bay Area. In 2013, NOS and the National Weather Service (NWS) partnered to issue alerts of potential respiratory impacts from harmful algal blooms (HAB). These HAB alerts are part of a broader experimental initiative that NWS is testing to expand use of their Beach Hazards Statement, which alerts the public about coastal hazards such as rip currents. NOS issues HAB forecasts for the public and coastal managers to protect public safety through the HAB Operational Forecast System. The addition of HAB alerts to Beach Hazards Statements will help this same public safety information reach a greater audience. 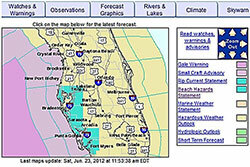 The Tampa Bay Weather Forecast Office was the first office to issue HAB alerts as part of their Beach Hazards Statements. The new alert expanded public awareness of the potential health effects and was timely since many of southwest Florida's beaches were facing a risk of red tide impacts when the alerts were launched in February. CO-OPS staff install a new air gap sensor on the Don Holt Bridge to enhance navigation safety and continue business development at the Port of Charleston. In 2013, several enhancements and a new site were added to the Physical Oceanographic Real-Time System (PORTS®). Data are now available online for a new PORTS® established in Charleston Harbor, S.C. 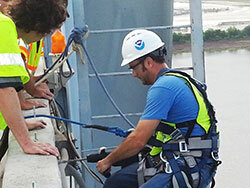 In June, the Center for Operational Oceanographic Products and Services (CO-OPS) worked in collaboration with the South Carolina State Ports Authority to install a new air gap sensor on the Don Holt Bridge to enhance navigation safety and continue business development at the Port of Charleston. In January, a new mobile application, Transit Time!, was developed for the Houston/Galveston PORTS®. The new app, developed in collaboration with the Texas A&M-Corpus Christi Conrad Blucher Institute, provides ship captains and pilots with real-time forecasts of water levels and currents along the Houston Ship Channel to improve transit scheduling. The U.S. Coast Guard partnered with the San Francisco Marine Exchange and CO-OPS to establish a new visibility sensor on the Oakland 38 Pier in San Francisco, as part of the San Francisco PORTS® in June. This new sensor will help mariners determine fog conditions in the Oakland region and support safe navigation in the challenging San Francisco Bay marine environment. In February, CO-OPS began a new service to deliver annual reports to PORTS® partners to inform them of the status of their systems. These annual reports are a new product that provided local partners with a snapshot of key information about their respective PORTS®, such as financial status, performance metrics, a work summary, and a preview of planned work for the coming year. In April, CO-OPS and the U.S. Integrated Ocean Observing System (IOOS®) collaborated to incorporate data from an IOOS current meter located near the Verrazano-Narrows Bridge into the New York/New Jersey PORTS®. The current meter was deployed by the Stevens Institute of Technology, a member of the IOOS Mid-Atlantic region. In May, CO-OPS implemented a new redundant current meter communication method that will improve data reliability by providing a secondary method for transmitting data using the GOES satellite. This new upgrade will also provide the ability to store data locally in case of a transmission failure. 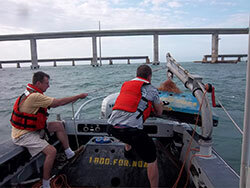 CO-OPS staff retrieve a micro m-TRBM current platform deployed at Moser Channel in the lower Florida Keys on April 11. The Seven Mile Bridge is in the background along with the lower unused old bridge. A m-TRBM platform with ADCP current profiler sits on the deck of the CO-OPS-owned SeaArk vessel. In 2013, the Center for Operational Oceanographic Products and Services (CO-OPS) completed current surveys in San Francisco Bay and the Florida Keys in an effort to update tidal current predictions for these areas. The last circulation survey for the Florida Keys was conducted more than 70 years ago and flow characteristics through navigational channels and harbors have changed significantly in that time. 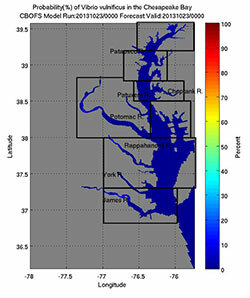 Measurements of speed and direction from 19 tide stations were analyzed to produce tidal current predictions in Key West harbor, New Ground, and Bahia Honda harbor. This year, CO-OPS also completed a two-year field project to measure currents in the San Francisco Bay Area. In 2012, twenty-five stations were deployed in the central portion of San Francisco Bay and outward past the Golden Gate and Bay Bridges. In 2013, an additional 32 stations were occupied in the southern part of San Francisco Bay and inland to the California Delta. The currents data will be used to update tidal current predictions for San Francisco Bay and support development of a new hydrodynamic model that will be launched next year. The 57 currents stations collected data in new locations, as well as replaced some older models at existing locations. These sites were selected based on the model, data gaps in present predictions, and to meet the needs of both mariners and the general public. The newly developed experimental Vibrio vulnificus probability model is one of the first products to emerge from the newly formed Pathogen team under the NOAA Roadmap. This is an example of the NOAA Roadmap effort to improve and expand development and delivery of operational ecological forecasts. For more than a decade, several NOAA offices have been researching ecological processes and developing experimental forecasts for a variety of ecosystem components, including harmful algal blooms, pathogens, jellyfish, brown shrimp, hypoxia, distributions of habitat and key species, sea level change, wave energy, and ocean acidification. The most advanced of these ecological forecasts are harmful algal bloom (HAB) forecasts, which are fully operational in the Gulf of Mexico through the HAB Operational Forecast System. While NOAA has been producing these experimental forecasts, there has not been a formal Ecological Forecasting Program encompassing these efforts, which raises challenges in identifying corporate priorities, securing long-term resource commitments, and maximizing the efficiency of existing forecasting abilities. In 2012, NOAA developed the framework for an Ecological Forecasting Roadmap—a prioritized, agency-wide approach for coordinating existing capabilities and operational environmental prediction and service delivery infrastructures. Such a broadly-supported NOAA strategy for ecological forecasting will offer management solutions to assure protection, maintenance and restoration of the health and productivity of ocean, coastal and Great Lakes ecosystems, for both natural resources and human communities. The outcome of the roadmap will be a suite of more accurate and reliable forecasts in all regions of the country concerned with HABs, hypoxia, and pathogens. This agency-wide effort will also help connect internal-NOAA activities to related efforts in the external academic community and private sector.